Each and every person desired low cost electricity and the Ministry was formulating plans to facilitate this. A new electricity meter which helped conserve electricity during peak hours of 6.30 pm to10 pm was introduced recently to coincide with the first anniversary of President Sirisena’s assumption to office. We have now provided 98 percent electricity supplies to the country. The balance 2 percent is the most difficult part, as it comprised people who have rejected electricity due to their economic difficulties. But steps have now been taken to cater to this section too who were unable to afford electricity supplies, said Power and Renewable Energy Minister Ranjith Siyambalapitiya. He expressed these sentiments addressing a meeting following the inauguration of the Indurana small scale hydro electricity scheme of the Sri Lanka Sustainable Energy Authority, developed as a model international small hydro electricity scheme on January 17. Minister Siyambalapitiya who expressed his gratitude to late Minister Sarathchandra Rajakaruna for donating a private plot of land to facilitate the Kadirana Hydro Electricity Scheme, said it would be named after later Minister Rajakaruna after developing it as a model international sustainable energy electricity scheme as a mark of respect to him. The Minister said all houses in Indurana and Daluwalane villages would be provided with 2 CFL bulbs each free of charge, to promote conservation of electricity. It would also help conserve electricity worth Rs 1.8 million annually. Apart from this, Samurdhi families in villages would be provided an energy saving cooker each free of charge. These cookers would provide better efficiency on low firewood use. 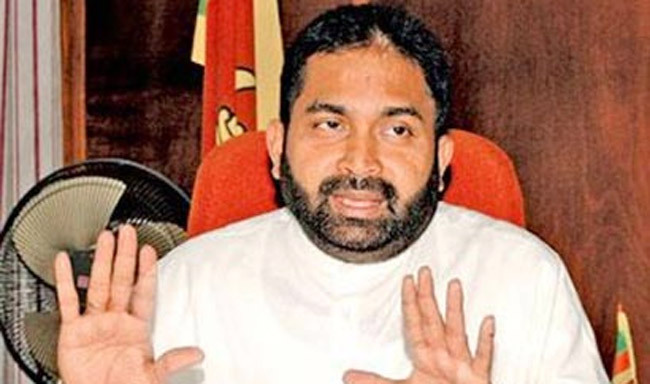 Minister Siyambalapitiya said the Ministry’s aim was to make the country self sufficient in power and energy. The Mannar region has a potential to provide 475 megawatts of electricity through wind power generation. The first such wind power project with a capacity of 100 megawatts would be launched by the Ceylon Electricity Board. A special tariff scheme would also be introduced for the benefit of the people who refrained from using electricity at peak hours. There are also plans to provide electricity free of charge to farmers who had not conserved electricity during peak hours. Parliamentarians Harshana Rajakaruna and Dr Thusitha Wijemanna, Sustainable Energy Authority Chairman Keerthi Wickremaratne and many other officials were also present.